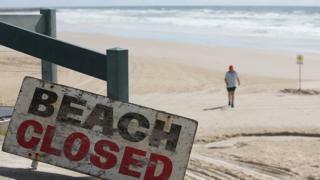 Beachgoers will be protected from sharks by drones and "smart" drum lines, according to the New South Wales (NSW) government. A trial will begin on the NSW north coast where there have been several attacks in the past 12 months. The drones will feed images back to operators looking for sharks using GPS co-ordinates. The measures are part of a shark management strategy which also includes barriers and helicopter surveillance. The state Labor opposition's shadow primary industries minster Mick Veitch said more details were needed about the trials. "This almost seems to have been plucked from the sky, the trial," he said, according to ABC.